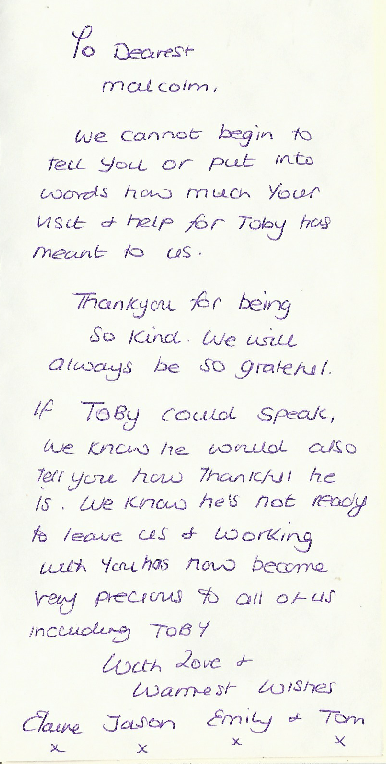 We cannot begin to tell you or put into words how much your visit and help for TOBY has meant to us. We will always be so grateful, if TOBY could speak, we know he would also tell you how thankful he is. precious to all of us including TOBY. Clair x, Jason x, Emily x, Tom x. It was a pity I was not called in sooner, but this is not the families fault as they were trying to find a healer. When I arrived the vets who were their could do nothing, they did not seem to be able to help so they left. Toby was in such discomfort, he was continually getting up and moving, he was having a great deal of trouble even breathing. Although I remained there for a long time treating Toby, I had to keep moving with Toby as he continually moved between rooms and positions. After I had finished for that session, Toby was lying still seemingly far more relaxed and breathing a lot better. It was obvious I had helped Toby a lot. His family were so pleased to see him much improved. But later in the evening Toby started to find it hard to breath again, so his owners decided to call the vets to put him to sleep to end his torture. I will always wonder if they had found me sooner the outcome would probably have been so different. 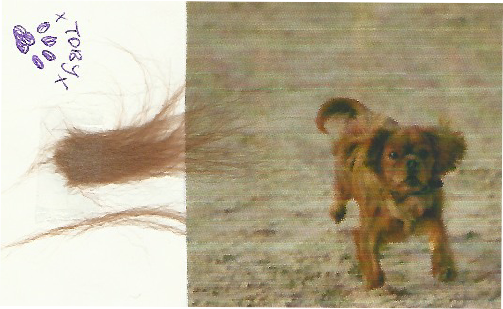 But no blame can be placed on the owners as they did all they could to help Toby who they all loved so much. I went back a few days later to treat all 4 of them in person to help with their grief, and I was very happy to see and tell them all in person where Toby was in the room in his spirit incarnation, still giving them his love. Another sad thing, I can not access the charities old accounts for this lovely families details, because of problems with a program after changing my laptop. While going through old paperwork to see what we can shred, I came across the above lovely card and letter they made me with a photograph and the above testimonial. While writing this to add here, TOBY came through to me and thanked me for my help back then, and asked if I could let his family know he is still visiting them and giving them his love. I will have to try to visit them before we move in the not to distant future. But if Clair, Jason, Emily, Tom, look at this site and read this message from Toby, I just wish to add they will always have my love and my light. He wanted to tell me to also let his family know he still visits them, and he feels they still know he is around at times. He is happy they have another dog to help as he had to leave them.